The Sisters popularity grew exponentially between 1983 and 1987, perversely becoming more hip during the periods of hiatus (after Ben Gunn’s departure, then again after the post-RAH split), and fans’ desire to feed their growing addiction to TSOM product spawned a huge interest in their back catalogue, and even more so for recordings of gigs, circulated amongst the fanbase on a swap basis or sold in dingy markets by traders with a eye for a quick profit. 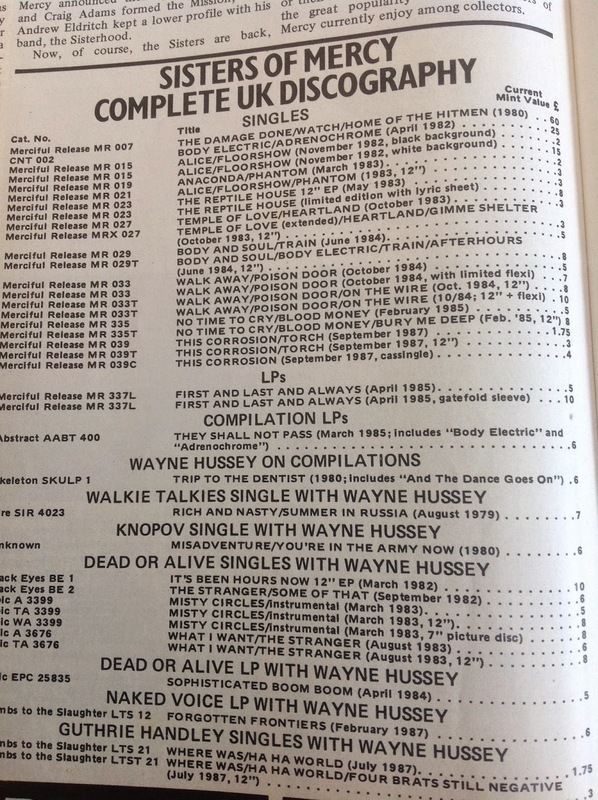 From around 1985 there seemed to be a new phenomenon with bootleg LPs appearing at an alarming rate, mainly from Europe, and although the sleeve design and production values were of variable quality to say the least, these too became hot items at the Record Fairs held in most British towns and cities at that time on a monthly basis, where traders and collectors could meet without the need for excessive postal charges and differing opinions as to what exactly consitutes “near mint” status. It was typical of the London based media though that the monthly bible for vinyl fans, Record Collector magazine, didn’t feature The Girls until November 1987 when This Corrosion had made the top ten, when lesser acts such as The Mission and The Long Ryders had already been featured. Contributor Paul Denman did a decent job of providing a detailed background history of the band whilst discussing the various Merciful Releases in chronological order. As was the custom with RC, the article was followed by a full discography with contemporary “current values”, including a mere £60 for Damage Done, which would have been a good investment, although interestingly some other rarer items (Walk Away + flexi, Reptile House + insert) have scarcely gone up in value since then. via I Was A Teenage Sisters of Mercy Fan: Record Collector.